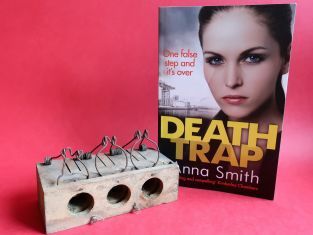 No.7 in the series – ‘Death Trap’ by Anna Smith meets a mousetrap for three! The museum has an interesting display of early farming items including tools, agricultural medals and this trap for multiple rodent capture. ‘Death Trap’ is one of nine books in the Rosie Gilmour series. Rosie is a gritty Glasgow journalist who will stop at nothing to get to the truth. Anna Smith will be at two events on Sunday 5th August – ‘Hold the front page’ in Rothesay Library and ‘The last Stand’ in the Museum.